Posted under Health Guides. Updated 28 March 2017. Cooking at home is often healthier and less expensive than eating out, however sometimes recipes contain terms that can be confusing. This guide lists the most common cooking terms along with the definitions to help you follow a recipe and learn new cooking skills! Some terms come with a video showing an example of that term; click the terms in blue to watch the video. To beat is to combine a mixture using a spoon, fork, or kitchen utensil called a whisk, or by using an electric mixer. The important thing to remember is to mix all the ingredients until the mixture looks smooth. Mixing by hand can get tiring. Try to use a fast circular motion with your wrist, not your arm. To blanch is to cook a food in boiling water for a few minutes. Blanching seals in color and juices and helps to remove skin or peels. This is usually done as a first step when preparing a more complicated recipe. To blend is to combine two or more ingredients by hand, with a blender, or by using an electric mixer. To boil is to heat a liquid (usually water) until many bubbles appear on the surface. A rapid boil is when the bubbles appear very quickly. To broil is to cook food (usually meat) directly under a heat source. For example, you can broil food in a traditional oven or in a toaster oven, on the broil setting. Food such as meat turns brown or crispy on the outside and cooks quickly. To brown is to quickly cook a food (usually meat) on the outside only. The reason for browning is to seal in juices and to make food more appealing by giving it color. This can be done using a frying pan or by broiling the food for a short time in the oven. Try to turn the food so that all sides are quickly cooked and have a brown or grilled look on the outside. To brush is to apply something such as a marinade or melted butter to a food. For example, to add a buttery flavor to fish, you can use a cooking utensil (brush) and apply a coating of melted butter before cooking. To chill is to place food inside of the refrigerator until it gets cold. To chop is to cut into small pieces about ½ inch in size. To cream together usually refers to blending butter with another ingredient, together like sugar, until the mixture is smooth and creamy. When a recipe calls for a fruit to be “cored”, it means to remove the center — or “core” of the fruit (which often has seeds or a pit. For example, to “core” an apple means to remove and throw away the center and the seeds. To cube is to cut a food into the size of a ½ to 1 inch cube shape. To dice is to cut something such as an onion into very small pieces about ¼ inch in size. When a recipe calls for an ingredient to be divided, it means that you will use the ingredient more than once in a recipe. Read ahead in the cooking procedure to find the measurement you need. To drain is to remove the liquid out of a food that you are cooking. A strainer or colander can be used to drain liquid from a food. To dredge is to coat food with an ingredient such as flour or egg. To drizzle is to lightly sprinkle a liquid such as melted butter on top of a food. To dust is to lightly sprinkle a dry ingredient such as confectioners sugar on top of a food. A Dutch oven is a heavy pot (usually cast iron) that has a tight fitting cover and is used for baking. To fold is to gently mix a lighter ingredient such as egg whites into a heavier one, such as batter. To garnish is to decorate food with herbs such as parsley, dill, or mint, lemon slices, vegetables, or other food items. To glaze is to pour a liquid (usually something thick such as a fruit sauce) over a food such as ham to give the food a certain texture and flavor. This process is usually the last step in preparing certain meats, vegetables, and dessert recipes. To grate is to break apart either a soft food such as cheese or a hard food such as carrots using a metal tool with different size holes called a grater, or by using an electric food processor on the “grate” setting. To grill is to cook food on a barbecue grill, stovetop grill, or hibachi grill. This cooking process uses flames to cook the food with high heat. To let stand is to let a food cool or set at room temperature before you cut into it or serve it. Lukewarm is a medium temperature that doesn’t feel either hot or cold to the touch. To marinate is to place food such as meat, chicken, fish, or vegetables in a seasoned liquid in order to give the food additional flavor before cooking. Real measuring holders such as measuring cups and measuring spoons are important for recipes. Pour dry ingredients into the measuring cups or spoons and level off with a flat knife so the amount is just right. When measuring liquids, it’s a good idea to use a liquid measuring cup. This is usually a 1 or 2 cup sized clear glass or plastic vessel with measurements marked on the side. You can set the measuring cup on a shelf or counter so you can easily see the line you need to pour to. To mince is to chop a food finely. For example, mincing an onion means to first chop the food, then cut it up even smaller by rocking a knife back and forth and across the food until the pieces are tiny. This process can be done by hand or by using an electric food processor. To mix is to stir or put together more than one ingredient. This can be done by hand with a spoon or by using an electric mixer. To peel is to take off the outer covering of a food such as an apple. A “peeler” is a kitchen tool that works well. 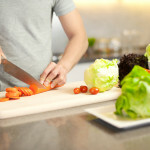 If you use a knife instead, always peel in the direction away from your body to avoid cutting yourself. A pinch is a very small amount of an ingredient that is measured between your thumb and index fingers. To puree is to blend to the texture of baby food. To reserve is to temporarily set something aside. For example, sometimes recipes will have you reserve liquid ingredients to add to the recipe later. To sauté is to fry lightly with a small amount of butter or oil in a pan. To season with is to add salt, pepper, herbs, spices or other seasonings to give a plain food more flavors. When a recipe calls for a fruit or vegetable to be seeded, it means to remove all of the seeds before cooking or eating. To scald is to bring milk to a quick boil and then remove it from the burner. To sift is to put dry ingredients through a kitchen tool called a sifter in order to remove lumps and to make the dry ingredients lighter. To simmer is to boil liquid ingredients very gently so that only tiny bubbles come to the surface. To slice is to cut food into long, thin pieces. To steam is to cook food over boiling water using a “steamer” basket that is placed inside a pot or by cooking food in a small amount of boiling water. To stir is to mix ingredients in a rotating motion in a bowl by using a wooden spoon or whisk. To taste is to add salt, pepper or an herb (amount is up to the cook) to give the food more flavor. To whip is to beat ingredients at a high speed by hand or with an electric mixer in order to make the mixture lighter. To whisk is to beat ingredients with a kitchen tool called a “whisk” in order to make sure the food is well mixed. Wilting occurs when heat causes spinach or other greens to quickly cook and gives it a droopy appearance.